Though emissions levels across the nation have improved, many areas of the country still have air quality that is considered to be unhealthy. The Austin-Round Rock region has been able to maintain attainment status, thanks in part to the forward-thinking policy makers that joined together to make Air Aware plans that limit the amounts of polluted air that we breathe. 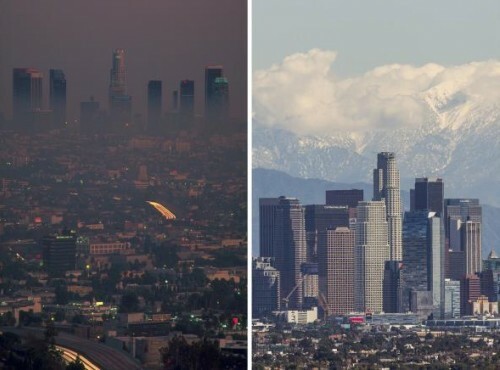 The photos below show the areas of the country that are currently not meeting a Federal air quality standard. VOC emissions have declined nationally from 23.1 million tons in 1990 to 13.7 million tons in 2015, a 41% decrease. Nationally, ozone levels are about 13% lower than they were 10 years ago. Ozone levels at Travis County’s two monitors have decreased by an average of 1.4 ppb/year and 1.3 ppb/year over this same time frame. Locally, ozone levels had been approximately at the level of the 1997 Ozone NAAQS from 1986-1999 but spiked in 1999 until finally experiencing a long-run decline between 1999-2016, as the chart below show. Nationally, average annual PM2.5 concentrations have decreased by 3.3 µg/m3 between 2004-2006 and 2013-2015 (a 26% decrease), while peak 24-hour concentrations 8.9 µg/m3 (a 27% reduction). Nation-wide, both annual and peak 24-hour PM2.5 concentrations have decreased by about 26-27% in the past ten years. Travis County’s annual PM2.5 concentrations were higher than 61% of the rest of the country, and peak 24-hour concentrations were higher than 54% of the rest of the country. The region’s annual PM2.5 concentrations have declined by approximately 19% between 2004-2006 to 2013-2015, but there has been little to no trend in peak 24-hour concentration.